The burgeoning street poet and producer reflects on his banner year of releasing music and dodging ballistic missiles. Ali has propelled himself onto the DIY hip-hop scene. His freshman year in the rap game just concluded neatly — marked by the release of the promising debut album Cult.18, a string of strong singles, plus a few feature appearances — but for about 38 minutes last January, Danny Ali thought his whole world was about to be destroyed. He was a senior at the University of Hawaii in Honolulu, wrapping up his final term studying marketing. On Jan. 13, 2018, the South San Francisco-born/Richmond-based rapper was at his girlfriend’s apartment when the now-infamous false ballistic missile alert was issued via cellphones across the state of Hawaii at 8:07 a.m.
Ali had no reason to disregard the doomsday warning (a false alarm message wouldn’t be issued for nearly 40 minutes) and to make matters even worse, the young gun was caught in a bout of food poisoning. The experience, however, wasn’t endured in vain; later that night following a few drinks he sat down at his computer loaded with the music production program Ableton and got to work on a new beat. He began with a spooky, descending synth hook — the type of melody that might soundtrack a vampire’s descent into the crypt — and then added an 808-kick beat to give cadence to his sometimes-merciless hip-hop persona: Red dot blue flame / Got all this blood on my fangs, it’s hurting my aim / Throw dirt on my name, you’re put in the dirt with a clip in your brain. In person, he’s the counter-opposite of such harsh lyricism. At 22 years old with a diamond stud in his ear, gold chain hovering over a clean sweater, and a pair of milky Adidas kicks on his feet, Ali is courteous when rehashing his past year. Whereas 2018 might be remembered as the time his childhood hero Kanye West fell from grace (Ali admitted it’s been complicated), it’s also the year Ali propelled himself onto the DIY hip-hop scene. He’s done so with a simple strategy: keep releases consistent and continue to strive for better and for more. In 2018, he released seven singles through his label Midnight Records. This is also the year he graduated from college and returned to Richmond to begin investing full-time in his career. His budding style will flow and shift from horrific boasts like “V M O B” or the Earl Sweatshirt-indebted “Membership” to auto-tuned ballads that exhibit range and heart like the crooning “White Blood,” where he crafted together a beat built around delicate synth-pop from the London duo Oh Wonder. With an EP titled CYAN set for release in February and a few shows lined up between the Bay Area and Los Angeles for the start of the year, Ali granted himself a pause to reflect on his last 12 months. And a cosign that was a long time coming. Ali’s year in music began on Jan. 2, 2018 with the release of the single “Dennis Quaid,” a buzz-off banger sporting a chorus that honors the dad of American actors: Go away go away / Soul Surfing Dennis Quaid, Parent Trap Dennis Quaid, Any Given Sunday / All work no play. He found the guzheng-plucked beat while digging down a YouTube rabbit hole and invited his friend Ban$hi to provide a guest verse. As for namesake, Ali himself is bewildered by his choice of the random Texas actor but a hook is a hook. 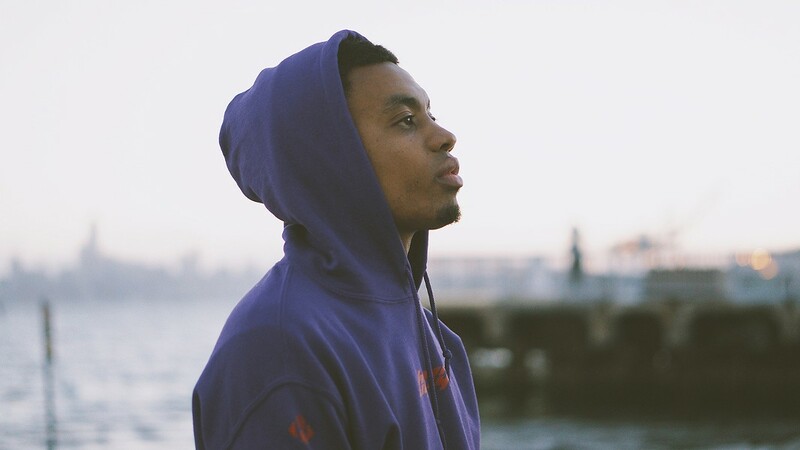 Perhaps Ali’s strongest output this past year was his debut LP Cult.18, a 26-minute concept album that challenges rap’s cultural influences and exchanges metaphors of joining a gang for that of joining a cult — a lifestyle he’s personally avoided but has seen friends from Daly City fall deep into. During a recent Tuesday afternoon, Ali was scouring for inspiration. He’s a visual-first artist, personally designing his album and single artwork, and his creativity can often be sparked in an instant. Thumbing through vinyl records at the Down Home Music Store in Richmond, he paused and stared down the cover of Live! The World of Ike and Tina, a colorful illustration portraying the soul duo on top of the literal world with continents comprised of metropolises, a California bear, classic advertising characters, and a split banana peel. Ali was smitten. “It looks like they’re action figures. And is that the Michelin Man? I love it,” he said.